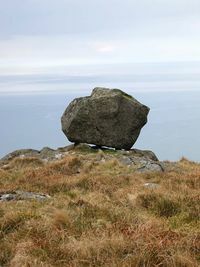 Perched erratic overlooking Tremadoc Bay. This sharp-sedged block was probably dropped from a melting glacier. P667864. The great variety of rocks that underlie Britain and Ireland can only rarely be clearly seen at the surface. Sea cliffs and mountain crags provide the exception rather than the rule, and for the most part the geological features are concealed beneath a cover of loose detritus, soil and vegetation. Some of this has been formed in situ, from the weathering of the underlying rocks, but across much of the UK the superficial cover was introduced, quite recently in geological terms, by ice sheets and meltwater during an ‘ice age’ that started about 2.6 million years ago until the last glaciers disappeared from the Scottish Highlands, only about 10 500 years ago. Kettlehole in glacial moraine, Canon Bridge, Herefordshire. P212915. During this period, bitterly cold intervals alternated with relatively warmer conditions, and the glaciers and ice sheets advanced and retreated accordingly. As they did so, they carried in and left behind till and glaciofluvial deposits — huge erratic boulders (Plate P667864), rubble, sand, and pulverised rock. Some of these deposits were sculpted by the passage of the ice into streamlined mounds and drumlin fields, the larger fields are clearly visible on satellite images, for example in northern Lancashire. Once the ice began to melt copious meltwater washed out vast spreads of sand and gravel while around the margins of the residual glaciers piles of debris built up creating distinctive landforms including moraine, eskers and kettleholes (Plate P212915). Although in rather less dramatic fashion, the cycle of erosion and deposition continues today. Eroded detritus from our hills and mountains is carried down by rivers and either redeposited in flood plains and estuaries, or carried farther out to sea into the subsiding marine basins that surround our coasts. So are formed the rocks of tomorrow. This page was last modified on 12 October 2015, at 11:30.